If you’re visiting Kyoto or Osaka, you’re within range of Nara. This former capital city of Japan remains a top spot for those who want to get away from busier metro areas and immerse themselves in Japanese nature and culture. You’ll experience friendly locals and deal with fewer tourists as the city itself is much smaller than its neighbours Osaka and Kyoto. There are also plenty of things to do in Nara. From exploring a few of the earliest temples to mingling with the deer, you should have no problem filling your day with fun activities. If you don’t know what to do in Nara, start with a trip to Nara Park. The park is a sprawling area of hills, forests, and ponds with lots of meandering paths. You’ll also find plenty of deer. The park and the city are known for the free-roaming deer that are considered Shinto messengers from God and are revered by locals and foreigners alike. They graze in the park and are occasionally found in other areas of the city as well. Visitors are welcome to feed the deer. 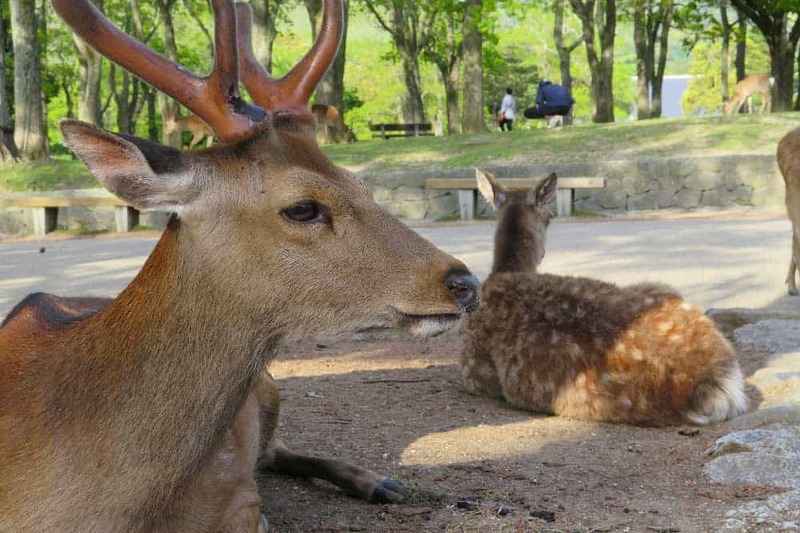 There are even vendors throughout the park that sell treats (shika-senbei) for the deer. While the park is lovely, the location is the main reason to make it your first stop, whether you’ve got just one day in Nara or few. Several of the next few Nara attractions are in or near to the park, making it the perfect central location to start from. Note that you can also get off the train near the park entrance. 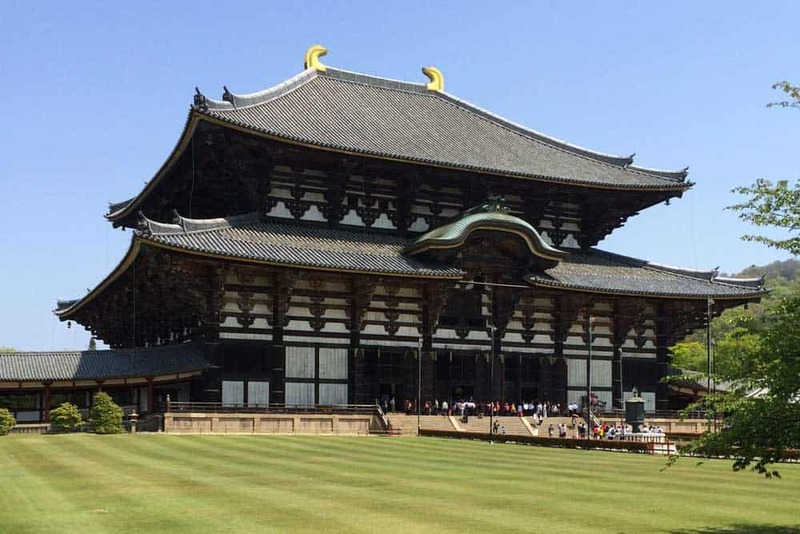 Nara is home to some of the oldest temples and shrines in Japan, including Todai-ji. It’s a necessary destination due to the sheer size of the giant bronze Buddha. It’s also in the northeastern part of Nara Park. Todai-ji, constructed in 752, is a complex containing many buildings. However, the main attraction is the Hall of the Great Buddha (Daibutsuden), the world’s largest wooden building, which houses the massive statue. The 16-metre-tall statue is the largest bronze depiction of Buddha in the world. The entrance to the temple includes the large Nandaimon Gate, which is a wooden gate flanked by two statues. You’ll also likely come across more deer. Japanese gardens are so popular that people recreate them in other parts of the world. 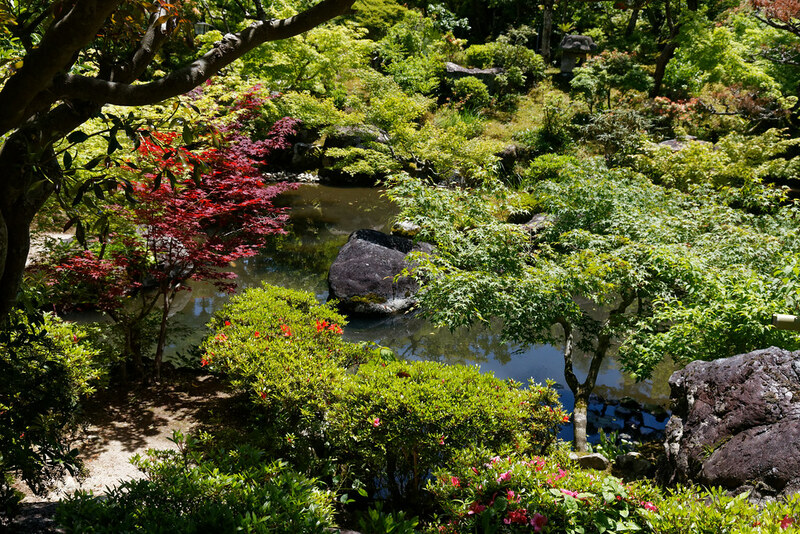 The Isui-en garden is a great example of Japan’s traditional botanical flare. It’s also inside Nara Park, making it an easy attraction to check out. You can even see the top of Todai-ji through the trees. The garden is expansive. It includes well-manicured lawns and ponds containing flowers, trees, and topiary of all sizes and colors. As you walk the paths, take short breaks to smell the flowers or check out the native plants. The garden is divided into two sections (a front and a rear garden) and each has its own pagoda while a number of tea houses are scattered throughout. To really appreciate the spectacular swirl of colours, visit in the fall when you’ll see the most diversity of colors. If you visit the park on a particularly crowded day, you may catch a break at Yoshiki-en garden. 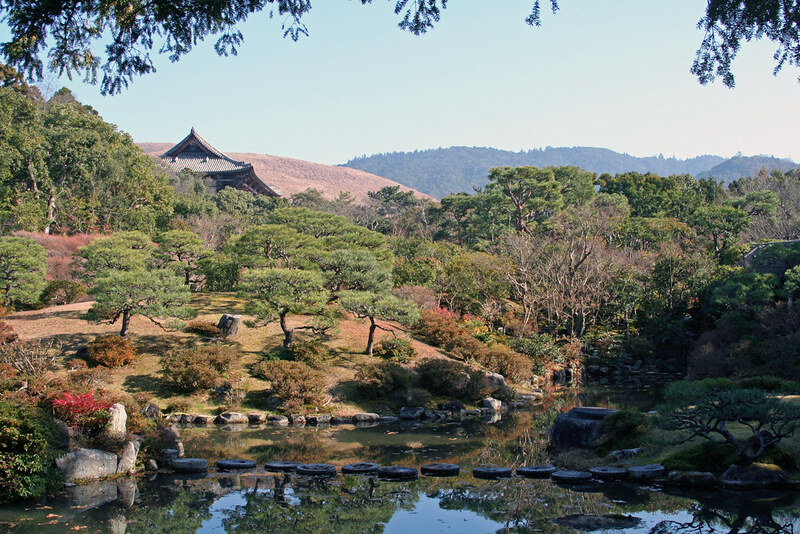 This garden is located just south of the Isui-en garden in Nara Park. It’s also frequently overlooked by visitors. The smaller garden includes a teahouse with a thatched roof and entrance is free. While the garden is smaller, it still offers a chance to enjoy the outdoors and view the unique style of Japanese gardens. The garden, broken into three parts (a pond garden, moss garden, and tea ceremony garden) doesn’t have a lot of topiaries and carefully trimmed shrubs. It’s simply a quiet, serene garden that offers a bit of a break from the busier parts of Nara Park. 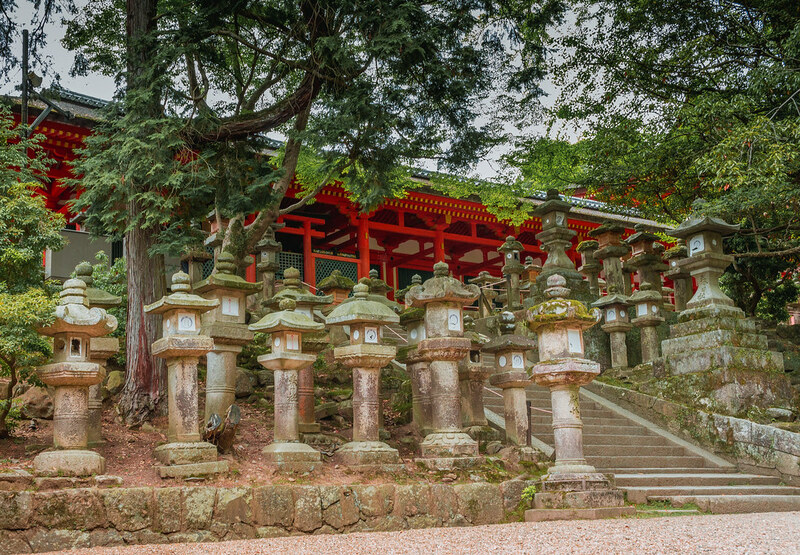 The Kasuga-Taisha shrine is one of the most visited Nara points of interest and another destination in the Nara Park area. Established when Nara became the capital of Japan, the shrine is dedicated to the deity responsible for protecting the city. You should take your time walking around the complex. The buildings are nestled in a forest of pathways, trees, and stone lanterns. The shrine is, in fact, famous for its lanterns that have been donated by worshippers over the years. You’ll also continue to encounter the free-roaming deer. It’s a good idea to get used to these animals and treat them with respect. As messengers of God, they’re considered an important part of the city even when they aggressively seek handouts from tourists. The shrine is open about two hours earlier compared to the Todai-ji Temple and the garden. If possible, try to make this destination your first stop, especially if you’re on a day trip from Osaka, to give you more time to explore each sight. Nara is full of history. While it may not contain more temples and shrines compared to Kyoto or Osaka, it’s got a few of the oldest temples, including Horyu-ji Temple. Horyu-ji isn’t in Nara Park, but it’s still just a short walk from JR Horyu-ji Station. The compound includes various temple buildings and a large museum. You can check out one of the largest collections of Buddhist images. However, the main attraction is the main temple hall. It’s the oldest wooden building in the world. It was built around 600 CE and then rebuilt in the early 700s. Designated a World Heritage Site in 1993, it’s also a cool-looking building and a wonderful example of the typical architecture used for these ancient temples. A “kofun” is an ancient grave. These tombs are found throughout the country. They are keyhole-shaped mounds that were mostly created between 300 and 700 CE. The largest kofun is just outside of Osaka. However, there are still some great tombs to explore around the Nara area. 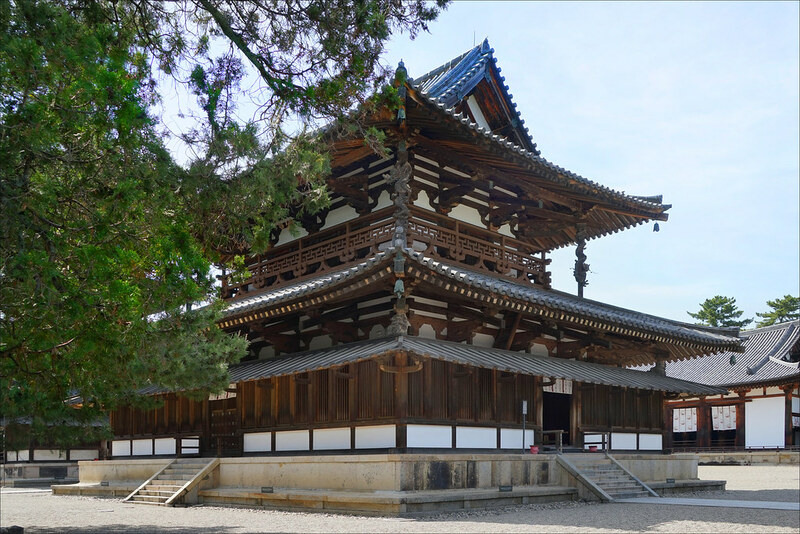 In Nara, you’ll find the Gosashi tomb, which is the resting place of the famous Empress Jingu. She was a regent who ruled Japan in the year 201. The tomb also contains Haniwa terracotta figures. You can find the tomb by visiting Heijo Palace, one of the UNESCO World Heritage Sites in Nara. The palace itself is also a fun destination. It was the imperial residence when Nara was still the capital of Japan. One of the best places to visit in Nara for eating, drinking, and shopping is the Naramachi shopping district. This neighborhood separates the park area from the rest of the city and includes a dense collection of shops, restaurants, homes, and small cafes. Walking the streets of Naramachi makes you feel as if you are stepping back in time to the early days of Japan. There’s still plenty of modern details, however, to remind you of the present, including the sight of tourists walking around with cameras. It’s a busy area and the best spot to go shopping and grab a bite before retiring back to your hotel. If you’re a night owl, you’ll find a variety of late-night restaurants and bars in the shopping district. There are even a few that are open 24-hour.